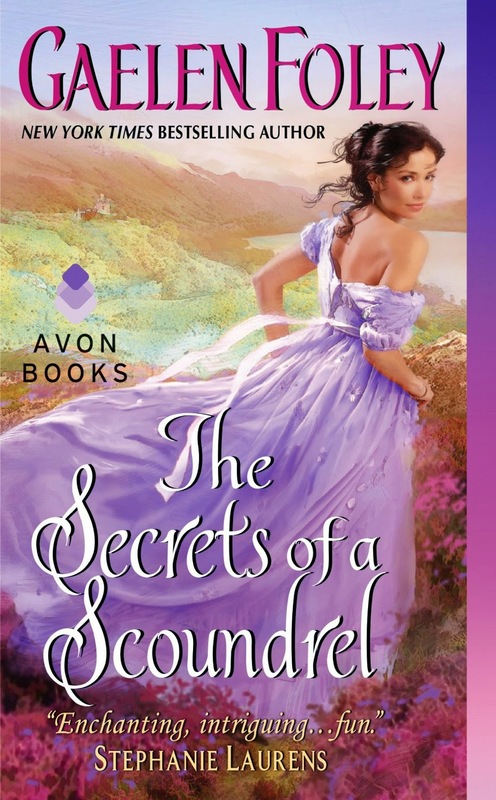 THE SECRETS OF A SCOUNDREL is the last book in the Inferno Club series. The one I’ve been waiting for because, well, Nick, Lord Forrester, is a scoundrel, which is saying something since none of the agents in the Order are particular angels. It’s fortunate he’s matched with Virginia “Gin” Stokes, Lady Burke, who happens to be the daughter of the man who trained the men in the Order, including Nick. Nick is serving time in prison for being, well, a bit of a traitor—though since he did take a bullet for the Regent, it was decided he couldn’t be hanged outright. Instead, he could cool his heels in prison for two years. He has served six long months of the sentence when he is offered parole if he helps Lady Burke rescue a girl who has been captured and is going to be sold at the Bacchus Bazaar. He agrees, not only because he is eager to leave the jail, but also that he didn’t know his handler, Virgil Banks, even had a daughter. And being that Virgil was like a father to him, Nick feels beholden to make sure nothing happens to Virginia, not even him. Of course, the latter proves to be difficult since she has loved him since she was 17 and saw him at her father’s house—and well, Nick has some difficulty keeping his hands to himself where Virginia is concerned. What follows is about 300 pages of an entertaining action flick, like Pirates of the Caribbean without the pirates…or ships, really, but, you know, exciting, dangerous, humorous, and breathless wondering “How are they going to get out of this?” I could not stop reading. Then on page 364, Nick said something that guaranteed this book will remain on my keeper shelf. I’d quote it, but I want you to fall in love with him yourself. Gaelen Foley does an excellent job of not letting the menfolk do all the work and take all the credit. Virginia lives up to her father’s training as she rescues herself time and again and quick-thinks her way into saving them both. Oh, and the walking the plank scene. (Oh, I guess it did have a ship! Hey!) Anyway, I highly recommend this story: very charming, exciting, humorous, and romantic. I been waiting for this book to come out. Great review, Hellie! I've enjoyed the Inferno Club series. Looking forward to reading this one! The secondary characters were a hoot, I thought. Her son. The "traitor". The madame. The bad guy they get the game piece from. *LOL* All very enjoyable. I've not read this series but I liked your review - sounds like something I would enjoy! I admit I haven't read all of the series either, but I didn't feel I was missing anything major and I really enjoyed her voice and pacing. I'm going to go back and read the rest. Downloading now. Great review, Hellie. Hellie, thanks for the review. I have enjoyed Galen's books, but this sounds like a real keeper. I like humor in a love story, and with all the other elements you've mentioned, it is one I will be downloading shortly. I can't wait to get to p. 364! Please, please, let me know what you think of page 364. (Feel free to post it on my facebook page--I am dying to discuss this with another reader. *LOL*) Just the best line ever I thought. Great review! Sounds like a fantastic read and I love the cover! The cover is gorgeous! I read this book ahead of a couple other review books I'd received--and I think it was partly because the cover was so pretty. I always want to read all the historicals. A lot of good ones here. I still have to get Grace Burrowes' The Captive. I love historicals and this looks like a wonderful list here, can't wait. Thanks so much for the review. This sounds like just the type of a romp of a story that is so enjoyable. Interesting characters worth getting to know and events that keep the story moving at full speed. This books has pushed its way to the top of my Must Read list. I am looking forward to reading it and finding what is on page 364.